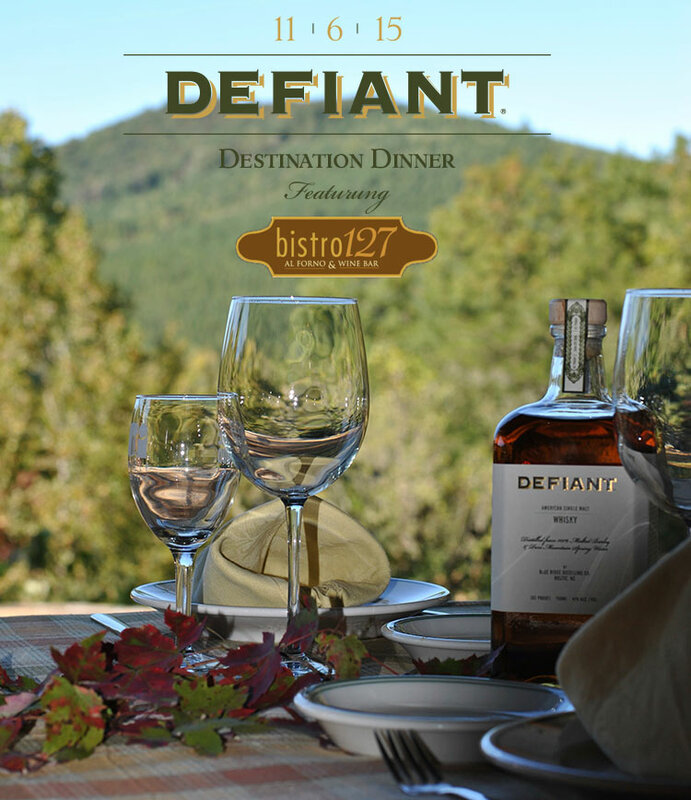 Join us on Friday, November 6, 2015 at Camp Golden Valley as we cater you with Bistro 127, a fusion restaurant located in Hickory, NC hosting the third installment of the “Defiant Destination Dinner” series. Start your evening on the wraparound porch, sipping beverages and taking in the gorgeous fall colors of the South Mountain backdrop. Dine near a wood-burning stone fireplace and relish in a Defiant infused 4-course menu created by Chef Mathew Miller using local heritage farm meats and organic ingredients. Bistro 127 is a full service restaurant providing a gourmet-casual menu to those who love all natural and organic ingredients. Click HERE to view and download the Nov. 6th dinner menu. Table reservations are $69.95 per person, 21-years old and older, and include a passed hors d’oeuvre, starter course, main entree and dessert, plus complimentary whisky tastings! RESERVATIONS ARE REQUIRED! Please click TICKETS to reserve your seat at the dinner table. You can also give us a call at 828-245-2041 or 828-286-9977 to make your reservation over the phone. all media assets ©2019 of Blue Ridge Distilling Co. Inc.